The present study was conducted to evaluate the in vitro and in vivo antiparasitic efficacy of active compounds from the bacterial extracellular products of Streptomyces griseus SDX-4 against Ichthyophthirius multifiliis. Bioassay-guided fractionation and isolation of compounds with antiparasitic activity were performed on n-butanol extract of S. griseus yielding a pure bioactive compound, nystatin (Nys), identified by comparing spectral data (EI-MS, 1H NMR, and 13C NMR) with literature values. Results from in vitro antiparasitic assays revealed that Nys could be 100 % effective against I. multifiliis theronts and encysted tomonts at the concentration of 6.0 mg L−1, with the median effective concentration (EC50) values of 3.1 and 2.8 mg L−1 for theronts and encysted tomonts (4 h), respectively. Results of in vivo test demonstrated that the number of I. multifiliis trophonts on the gold fish treated with Nys was markedly lower than the control group at 10 days after exposed to theronts (p < 0.05). In the control group, 85.7 % mortality was observed owing to heavy I. multifiliis infection at 10 days after the exposure. 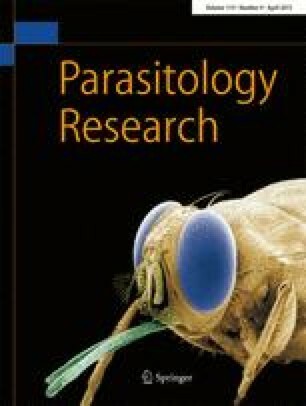 On the other hand, only 23.8 % mortality owing to parasite infection was recorded in the groups treated with the Nys (4.0 and 6.0 mg L−1). In addition, our results showed that the survival and reproduction of I. multifiliis tomont exited from the fish were significantly reduced after treated with the 6.0 mg L−1 Nys. The median lethal dose (LD50) of Nys for goldfish was 16.8 mg L−1. This study firstly demonstrated that Nys has potent antiparasitic efficacy against I. multifiliis, and it can be a good candidate drug for chemotherapy and control of I. multifiliis infections. The research was supported by the National Natural Science Foundation of China (31302211), the Commonness and Commonweal Technology Application project program of Zhejiang province (2014C32055), and the key project program of Huzhou City (2012GN12).